Marshmallow-topped butternut squash was my favorite Thanksgiving side dish back in my former ‘crab-ohydrate‘ eating days. I don't miss those sugar crashes after eating it though, which is why I no longer even want to eat sides like those anymore. But I do still crave the taste of lightly sweetened butternut squash on Thanksgiving. 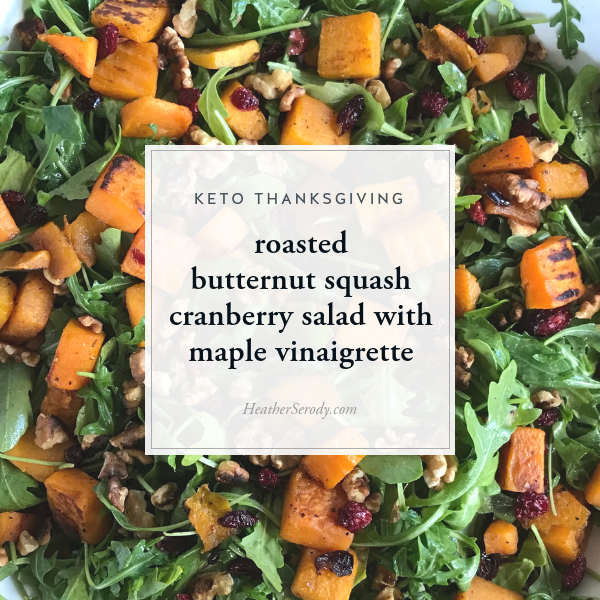 This recipe is my low carb adaptation of Ina Garten's butternut squash salad recipe. My adaptation uses stevia sweetened cranberries (super easy to make yourself), substitutes low carb maple extract instead of maple syrup, and uses stevia simple syrup to sweeten things up without adding any extra carbs. 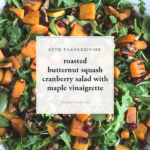 The toasted walnuts bring a nice crunchy texture to this roasted butternut squash cranberry salad. The maple vinaigrette brings everything together with a slightly sweet tang. 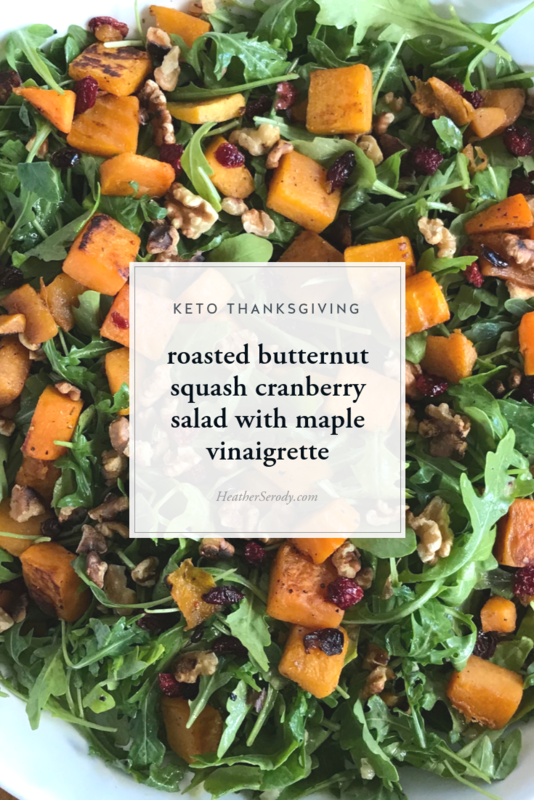 With just 8 total carbohydrates & 2 g fiber per serving, this salad is a great way to work a little bit of your favorite naturally sweet fall flavors into your low-carb Thanksgiving game. Or, feel free to add some protein and call it a meal any time of year. You'll need some special low carb ingredients to make this salad low carb, so be sure to order/purchase them well ahead of making your salad. unsweetened dried cranberries – you want dried cranberries with nothing added. Do not buy freeze dried cranberries, they won't reconstitute. Reconstitute & sweeten your cranberries up to 1 week ahead of time. Store drained cranberries covered in the refrigerator. You can prepare the dressing up to 3 days ahead. Roast the squash up to 2 days ahead, cover and refrigerate until ready to use. Allow squash to come to room temperature before adding to salad. Toast walnuts and assemble the salad right before serving. Place cranberries in a small oven proof bowl and pour just enough boiling water over to cover. Add 1 tsp. stevia and mix to combine. Allow cranberries to reconstitute for at least 15 minutes. In a medium-sized bowl, add avocado oil, 1 tsp. maple extract, 1 tsp. stevia simple syrup, 1 tsp fine grain sea salt, & 1/2 tsp freshly ground black pepper. Whisk to combine. Pour over butternut squash, then toss together with your hands until the squash is evenly coated. Add the cranberries to the butternut squash tossing to combine. Roast for an additional 10 minutes or until the squash is just starting to caramelize on the edges and is tender, but not mushy. Dry toast the walnuts in a medium pan over medium heat for about 5 minutes, tossing frequently, until fragrant and just starting to brown. Watch carefully so they don't burn. In a small saucepan over medium heat, add 3/4 C of water, vinegar, and shallots/onion. Bring to a simmer & cook, stirring occasionally until reduced by half, about 8-10 minutes. Remove from heat and whisk in Dijon mustard, olive oil, lemon juice, 1 tsp. stevia simple syrup, and 1 & 1/2 tsp. maple extract. Taste for seasonings & sweetness and adjust to your preference. Arrange arugula in a very large low rimmed serving bowl (a large pasta serving bowl works best). Pour half of the dressing on top of the arugula and lightly toss to combine. 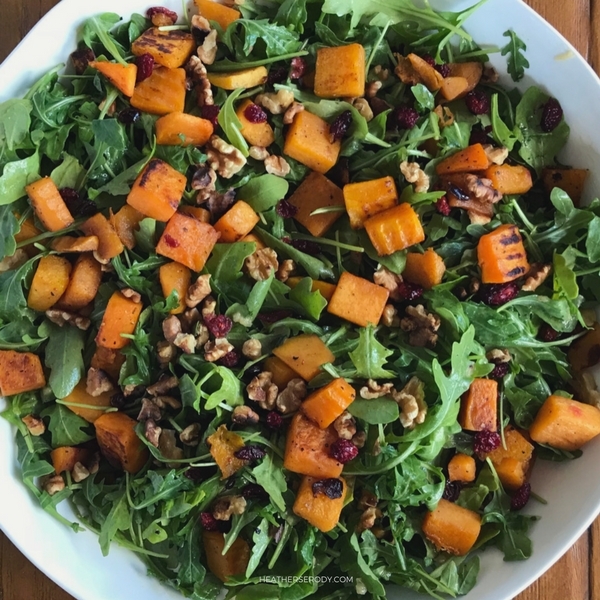 Scatter roasted butternut squash, cranberries, & toasted walnuts evenly on top of the arugula.